During the late spring and summer months, the number of daylight hours (daylength) increases the further north that you travel. The number of daylight hours (daylength) is critical to the development of onions. It tells the onion when to begin producing a bulb as well as when to stop growing that bulb. This is why varieties with certain day length characteristics grow well in certain areas of our country. Onion plants are catagorized into three groups, long day, intermediate day, and short day. Simply put, long day varieties begin forming bulbs when the length of day reaches 14 hours or more. They grow best in northern areas. Intermediate day onions begin bulb formation at 12 to 13 hours of daylight. They grow well in most areas of our country except the far north and deep south. Short day varieties start forming bulbs earlier in the growing season when day length reaches 10 hours or more, therefore they grow best in southern areas. Most of the sweetest onions are short day varieties. You can grow them in northern areas, they just won't get as big, but they will be sweet. The Walla - Walla however is a sweet onion that grows best in mid to northern areas. Onions that are called "good keepers" will last a long time (keep) after they have been harvested. As a rule, sweeter onions do not keep as well as more pungent varieties because sweet onions have a higher water content. The best way to store sweet onions is to keep them in a dry cool place and not let them touch. More about storage later. Onions will grow best in raised beds. They like a ph level between 6 and 7. Incorporate a good fertilizer(10-10-10 or 10-20-10) into the soil at planting. About one month after planting sidedress with our special 21-0-0 Ammonium Sulphate at a rate of 1 cup per 20 feet of row Repeat this every 3 to 4 weeks during the growing season. Always water after fertilizing. Onions love water, the tops however do not need to stay wet for extended periods of time as this will lead to disease. So keep an eye out for blight (leaves begin to to turn yellowish) and purple blotch (purple spots on leaves) during extended periods of heavy dew, fog, and rainy spells. Try to plant them in an area with good drainage and where air can circulate. 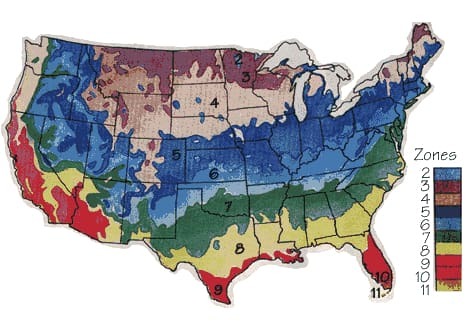 Use this zone map to determine the aproximate planting time for your area. If you wish we will determine the appropriate ship date for you. In your raised beds, plant the onion plants about one inch deep - 5 inches apart. If you like to harvest green onions for salads or other dishes, plant the plants about three inches apart. Pull every other one for green onions, leaving the others five to six inches apart to grow into large whole onions. Incorporated a balanced fertilizer such as 10-10-10 or 10-20-10 into soil at planting. About a month after planting, feed them with 21-0-0 Ammonium Sulphate onion fertilizer at a rate of 1 cup per 20 feet of row. Repeat this process every 3 to 4 weeks. Always water immediately after feeding. As plants reach full size and maturity, the soil can be allowed to become more dry. If possible avoid watering within two weeks of expected harvest time (you can tell by their necks becomming softer). This will increase storage time. When the tops of the onions have fallen over they are fully mature. Pull the onions from the ground and allow to dry. Cut the tops of the onion after it has dried, also trim the roots. To make the onions last as long as possible store them in a dry cool place and keep them from touching. The two best methods are: 1) wrap each onion in newspaper to keep them from touching. 2) Use old stockings. Drop an onion in the end of the stocking,tie a knot just above it, then drop another onion into the stocking. Repeat this until the stocking is full. When full, hang in a cool dry place.